Every summer I get in a frenzy about this time of year. There are only a few days left before back -to-school PD begins. Panic! The summer sales are on, many of the jobs around the house are as yet undone, I haven’t gotten to visit with all my friends & family as much as I want, and I haven’t read all the books I meant to! Whew! 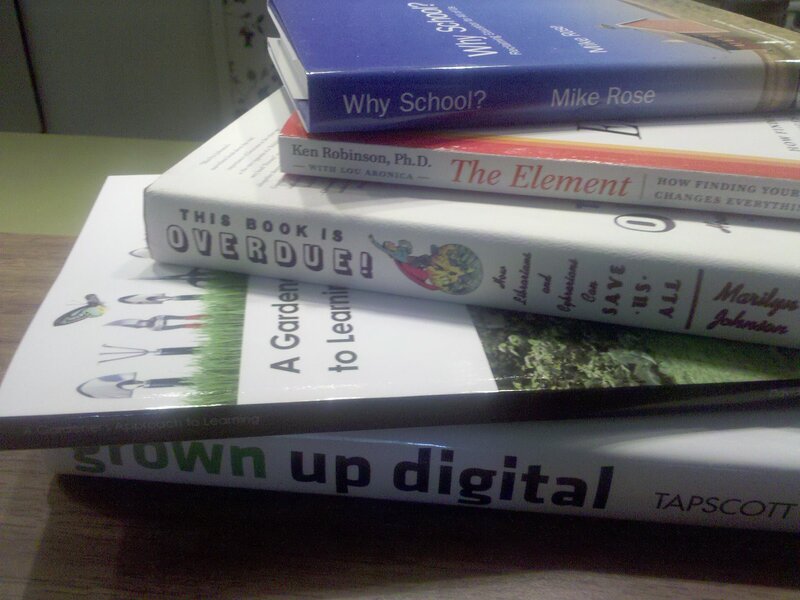 Here’s what’s still on my “to read” pile! I’ve started 2 of them already, so I might have a fighting chance…so what am I doing here! Gotta go read! Students Connect…Thanks to Good Books! You’ve all been where I was this morning: caught underprepared (read that “woefully unprepared”) for my day’s classes! The days have been filled with TAKS testing, crazy schedules, and meeting upon meeting, library fund raising, blah, blah…and I had simply not prepared sufficiently for my big kids! Twitter network to the rescue! Before school, I saw a tweet about Betsy Bird’s 100 Best Children’s Books, and the Animoto video that Maggi Idzikowski prepared to go along with it. They saved my day!! What a great basis for a sort of wrap up session with our soon-to-graduate 5th graders! I started off with the video, first relating to them something that a professor and mentor of mine, Dr. Ruth Cox Clark, used to tell us: everyone should read Charlotte’s Web once every ten years. As with most good literature, you will get something entirely new from it each time you read it! As they watched the books of their childhood flash across the screen, they exclaimed over and over again, “Oh! That was a good one!” or “I LOVED that one! Remember when Mrs. S read that to us?” All of the classes–even the ones peopled with some of our harder-to-engage students–had great discussions about the books they remembered and who they read them with! It was a great exemplar of the power of literature! Since our last checkout is coming up soon, I challenged them all to try a book from the list that they have never read before. The books just about flew off the shelves! Hopefully many of them will be read, too! All the classes certainly spent time reading and talking about their books and memories before they left–and without my directing it! It was a nice thing! Before they went back to class, students entered the name of a children’s book that they’d enjoyed & that they thought every student should read before leaving our school. 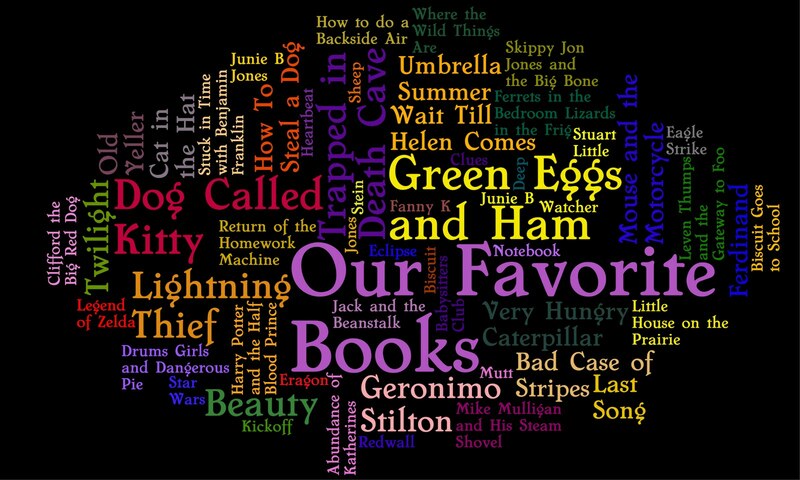 Then I used Tagxedo to make this word cloud for our web site! I’m thankful for my Twitter network! I’m going to stop blogging and tweeting now though, and prepare for my next couple of weeks’ classes! I promise! ….is it summer yet? Our group reviewed LookyBook tonight, which looks like a very interesting web site! At Lookybook, you can do just that: look at a children’s picture book online–the entire thing! What a great resource for classroom teachers and librarians! It’s a great selection tool as well as being a fantastic way to share the illustrations in a picture book. Very slick! And best of all…..it’s not currently blocked in our district!!! We wondered about the copyright compliance of it all, and I did some reading–started with the terms of service. But here’s an article from the Novato (CA) Advance newspaper that leads me to think that copyright is not a problem in our classroom settings. Lookybook allows you to set up your own “bookshelf” so that you could have the books you plan to use with your classes collected in one easy place. And one of the coolest features is that you can embed a book into a web page or blog! Very, very slick!! AllTop and Another Social Network for Booklovers! In Web 2.0 class, we’ve twice visited and played around with Librarything–a big favorite in a room full of librarians, as one might guess. Well, I have two new links to share that I’ve recently discovered: AllTop and Shelfari. I don’t remember how I found AllTop, and I don’t know how long it’s been around, but it’s new to me! Here, they collect news items from “all the top” sources, and aggregate them into collections such as education, culture, geekery, etc. How they decide what the “top” sites are, I don’t know, but I’ve found some interesting education articles and news items here! Another nice facet is that when you mouse over an item, you get a preview. Cool! When I was browsing Alltop the other day, I discovered Shelfari. If you like Librarything like so many of us librarians do, take a look at Shelfari! It’s a social networking site for booklovers–you can create your own bookshelf that really looks like books on a shelf.I like this cool interface better than Librarything. Very cool! Librarians, go check it out!